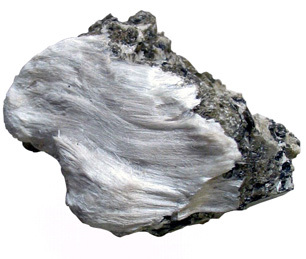 Natural asbestos fibers on muscovite. Asbestos has never been a major concern in water treatment. “Asbestos” is actually a general term used to describe six separate fibrous materials. All have separable long fibers that are strong and flexible. Asbestos forms the basis of more than 3,000 separate products. For example, brake pads, roofing and cement pipe for water distribution. It has been a popular product since the 1800s because of its strength and resistance to heat. It is very absorbent and has great tensile strength. Asbestos exists in natural sources, but the main exposure to humans is from the breakdown of manufactured products. Use of asbestos cement for water pipes has been the main contributor of asbestos to water supplies. Asbestos is primarily a health concern when inhaled, rather than ingested through water. Some people who drink water containing asbestos well in excess of the maximum contaminant level [7 million fibers per Liter] for many years may have an increased risk of developing benign intestinal polyps. Reverse osmosis is the preferred method for asbestos treatment at point of use.